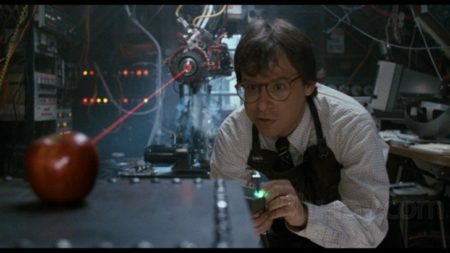 One of my favorite movies as a kid was “Honey I Shrunk the Kids.” I loved technology and weird gadgets, and I thought the movie did a great job of capturing what it might feel like to shrink down to a tiny size for a while. Of course, the physics behind the concept seemed impossible. So it was quite a surprise to me that MIT scientists recently invented a way to shrink basic objects using just an absorbent gel and a laser. It even has a cool name: implosion fabrication. The technology is currently limited to very simple structures, but scientists believe it could be expanded to include robotic particles, microchips, lens, and medicine. Those are all quite practical. So what would be impractical and awesome to shrink? The limitation is that I’m not aware of a way to unshrink things. As great as it would be to, say, shrink your luggage or even your entire house when traveling, it wouldn’t do much good unless you could embiggen it later. What about food? Like that tiny pizza in Back to the Future 2? It would be quite efficient to eat an entire meal in one bite, especially if space and time are at a premium. I’m hesitant to talk about shrinking living creatures…as cute as a palm-sized Biddy would be, he wouldn’t be particularly happy about suddenly being a 10th of the size of Walter. If this technology takes off, what would you like to shrink? This entry was posted on Wednesday, January 23rd, 2019 at 10:31 pm	and is filed under movies, technology and tagged with technology. You can follow any responses to this entry through the RSS 2.0 feed.